I love the French! What other country takes eating so seriously? On my fourth day in Paris during my 2007 summer in Europe, my friend Teresa and I were strolling down the sidewalk from our apartment to the metro, eating our daily breakfast of pastries (heavenly! ), when a runner passed us and wished us both “Bon appetit!” I think I was destined to live in this country. 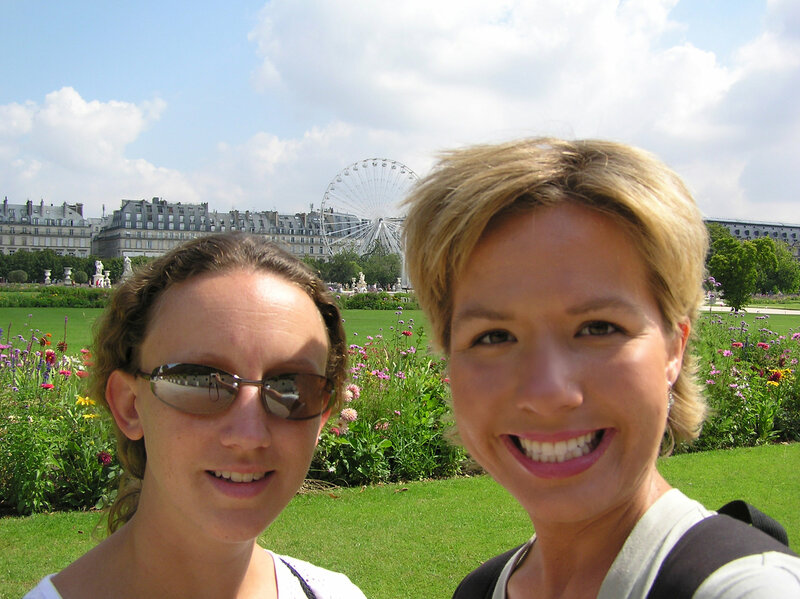 We took the metro to the Jardin des Tuileries and walked through the beautiful and peaceful gardens. I wish I had had more time in Paris because I would have loved to spend a morning or afternoon sitting in one of the city’s gardens, by a pond or under a tree, reading or writing or chatting or sleeping. These gardens were made for those pastimes! We crossed the garden, exited on the other side, walked along the Seine, then crossed the river to the Musée d’Orsay. This was one of my favorite museums in Europe! Or at least, favorite art museum. 🙂 Entering into the huge, main hall which used to be a train station, we grabbed some maps and headed up to the fifth floor which is filled with impressionist art. 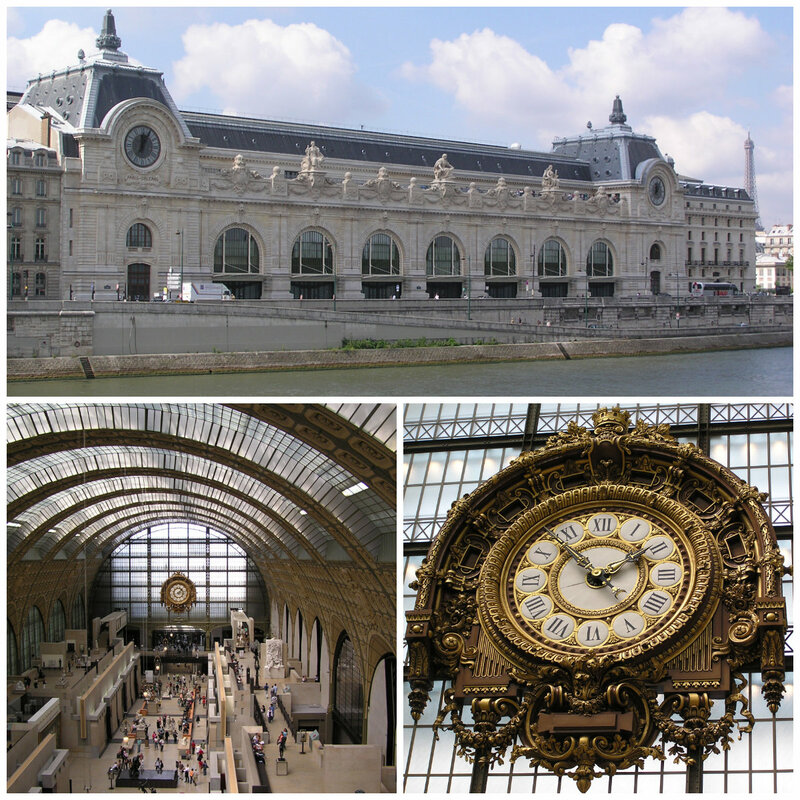 The Musée d’Orsay actually houses the largest collection of impressionist masterpieces in the world. We explored this floor and saw many works by Monet, Cézanne, Degas, Manet, Matisse, Renoir, van Gogh; the list goes on and on! It was so neat recognizing so many pieces of art! 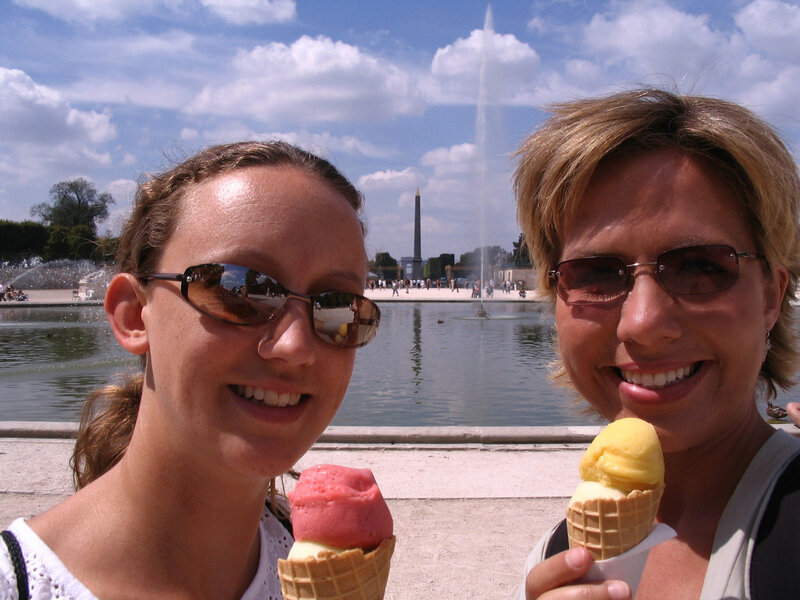 We walked back across the river to the Tuileries Garden where we each bought some sorbet. 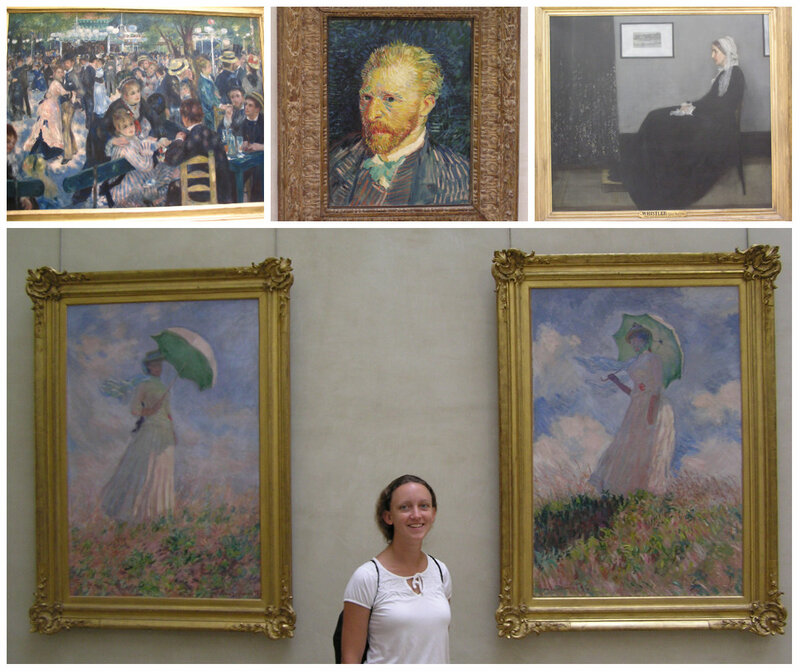 After finishing our treats, we walked to the Musée de l’Orangerie, an art gallery located in the Tuileries Gardens. 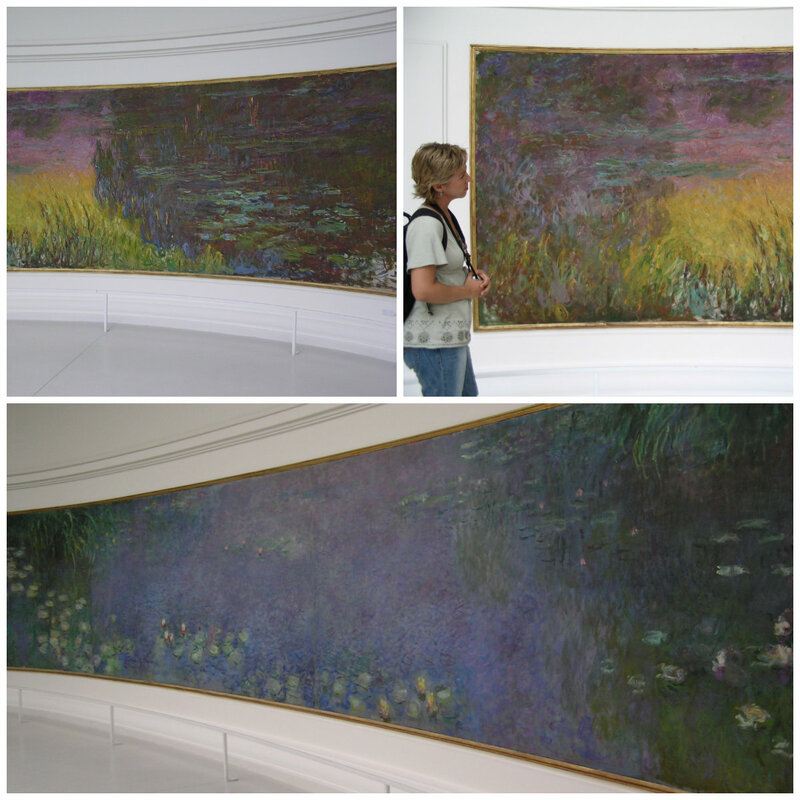 This museum houses what I consider to be the most impressive piece of art I’ve ever seen: Monet’s Nymphéas (or Waterlilies). These four enormous paintings fill two oval-shaped rooms that were designed specifically for these works of art. They are so impressive. If you’ve seen the movie Midnight in Paris (any lover of this city must see this movie! ), then you’ve seen these paintings in one of the scenes. 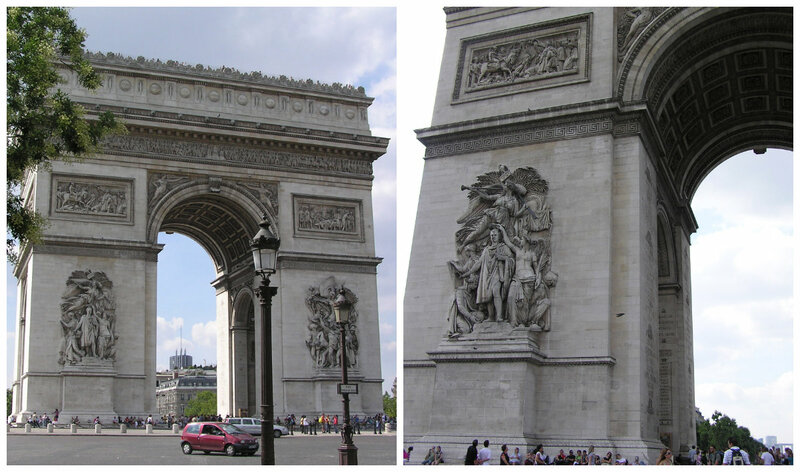 Leaving the Musée de l’Orangerie, we hopped on the metro for a trip to the Arc de Triomphe. We had already seen it from the Champs-Élysées the evening before, but didn’t realize how huge and impressive it really was until standing directly underneath it. The Arc de Triomphe stands in the center of the Place Charles de Gaulle and honors those who fought and died for France in the French Revolutionary and Napoleonic Wars. We climbed the 284 stairs to the top of the arch where we had a panoramic view over Paris. We could see all the way down the Avenue des Champs-Élysées to the Place de la Concorde, the Basilica Sacré Cœur in the Montmarte area, and of course, the Eiffel Tower. 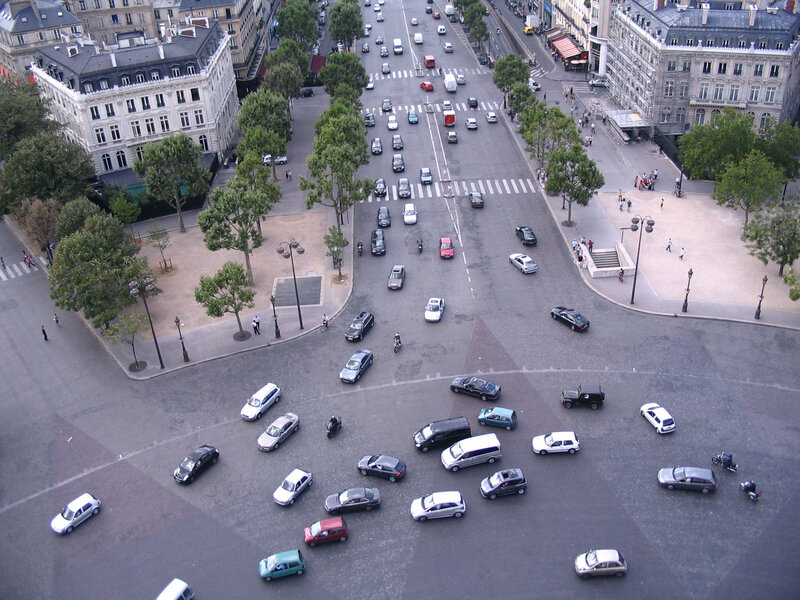 We walked around the viewing area taking pictures and watching the cars navigate the huge roundabout below that surrounds the Arc de Triomphe (these drivers have nerves of steel!). 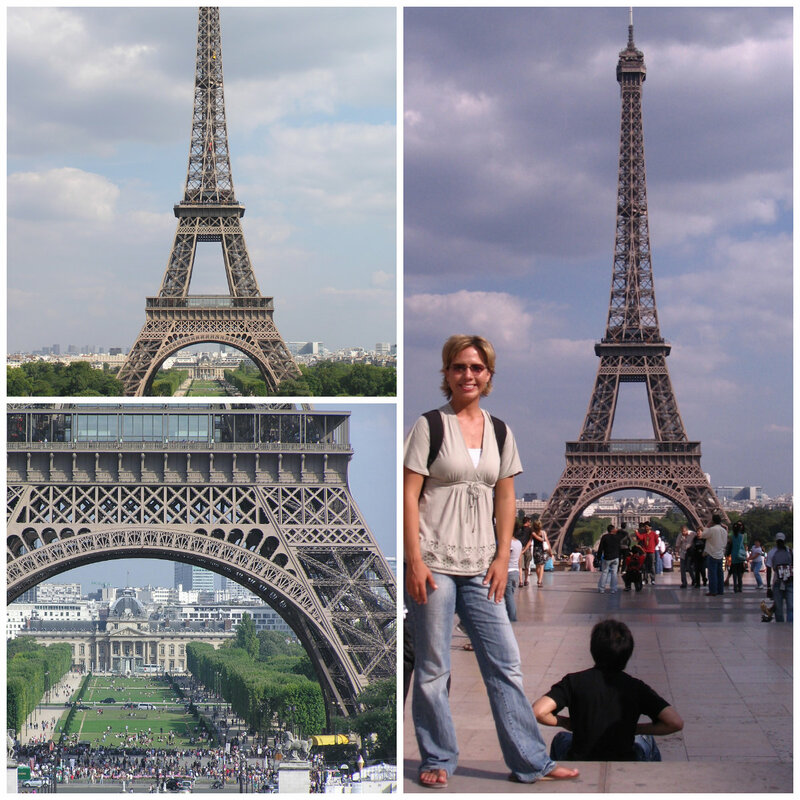 After making our way back down the stairs, we got back on the metro and headed toward the Eiffel Tower area. I would get excited every time I caught a glimpse of the Eiffel Tower. I just found it incredible that I was actually, finally, in the city I had dreamed of visiting for so long! Finished with dinner, we took the metro back to the Tuileries Gardens and walked to the carnival area which the Gardens host every summer. 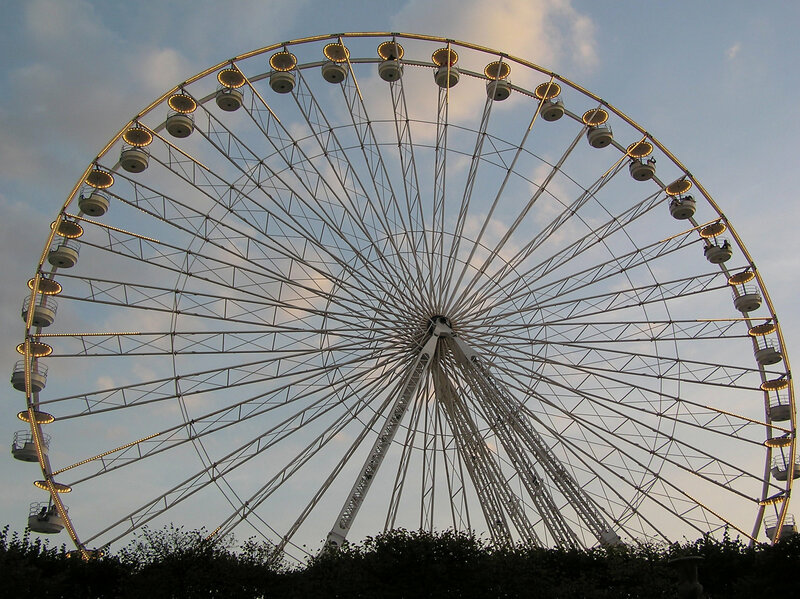 My sister-in-law had visited Paris a few years earlier and told me that one of her favorite memories was riding the ferris wheel as the sun set over the city. So we boarded a ferris wheel “bucket” as the sun was setting and she was right – amazingly beautiful! We absolutely could not have picked a better time to enjoy our ride. Definitely a highlight of my time in the City of Lights! After doing some souvenir shopping, we made our way back to our apartment for the evening, looking forward to our next day of exploring this amazing city! Entrance to the Musée d’Orsay, Musée de l’Orangerie, and the Arc de Triomphe were included in the Paris Museum Passes we had purchased during our first day in Paris. The Jardin des Tuileries hosts a carnival every summer which runs along Rue de Rivoli. Along with the ferris wheel, there are numerous other carnival-type rides to enjoy. 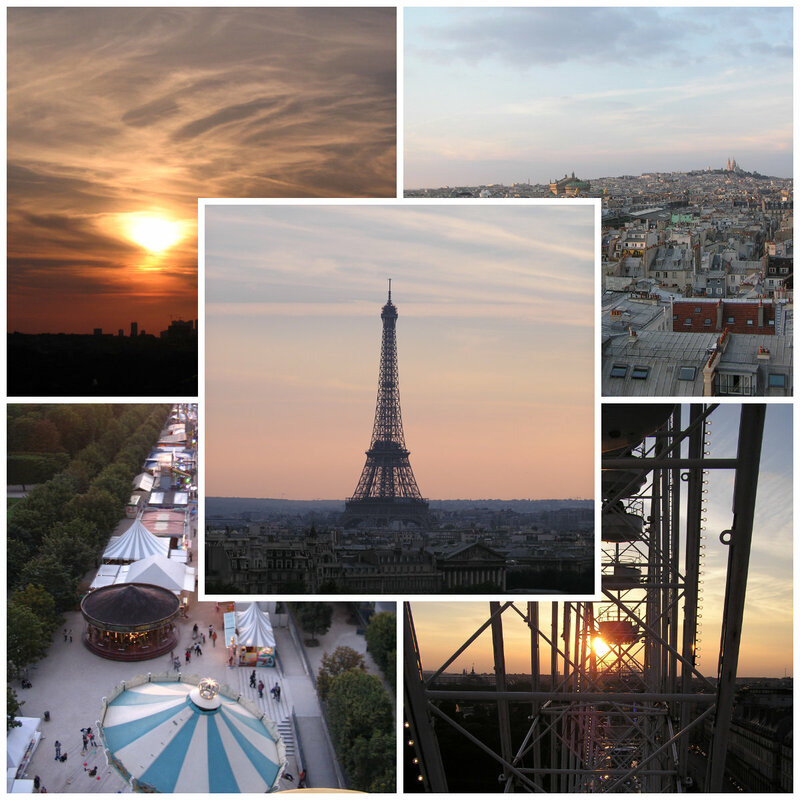 I highly recommend a ride on the ferris wheel for an amazing view over Paris!